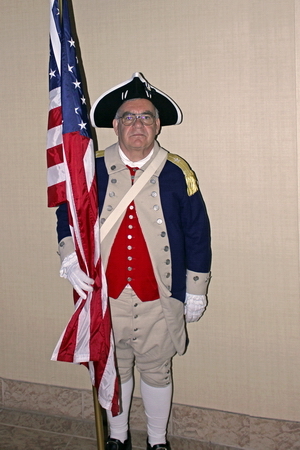 The MISSAR Color Guard was reorganized in 2004 by current CG Commander, Gerald Burkland, after originating in the mid-1990s with six members, including an NSSAR Minute Man, a Great Lakes District VPG, and a former MISSAR President. Commander Burkland's desire to reorganize the MISSAR CG was inspired by work performed with grave rededications, as well as observing the NSSAR Color Guard. 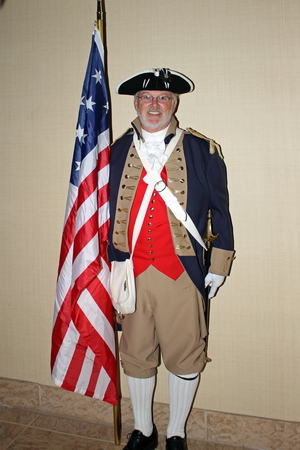 Currently, the MISSAR Color Guard has adopted the "Washington Guard" uniform - the one worn by General Washington's personal Life Guard, but also permits other uniform styles of the period to be worn. *National Society Sons of the American Revolution. Color Guard Handbook. Front Row: Commander Gerald Burkland, Bill Sharp, Don Reifert, Dave Moore; 2nd Row: Norm Palmer, Joe Conger; 3rd Row: Paul Callanan, Bill Vette; 4th Row: Vice Commander Ken Goodson, Dennis Van Wormer, Aaron Wiles. 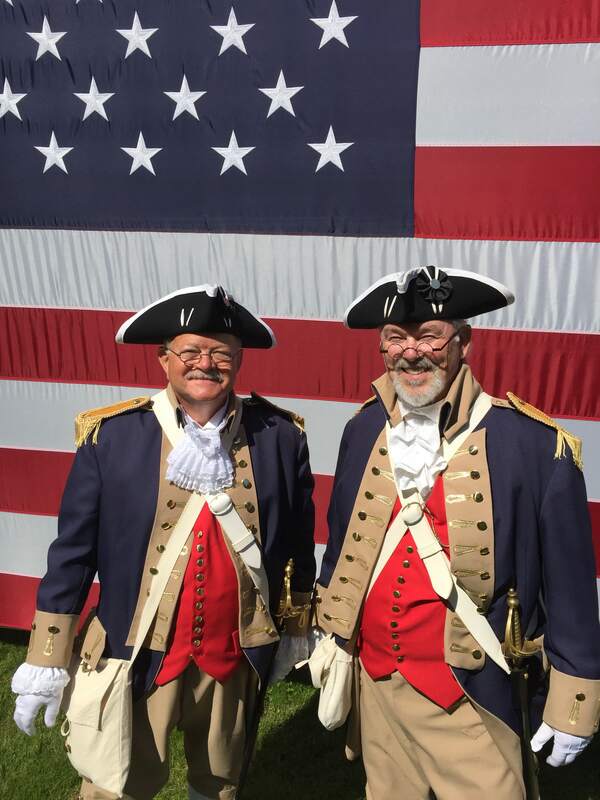 Parades, Society meetings, patriot gravesite dedications, gradeschool presentations...click here to see what the Guard has been involved in. The Sword Salute is a proud tradition of the Color Guard. Click here to learn more. The Color Guard is the face of the SAR. 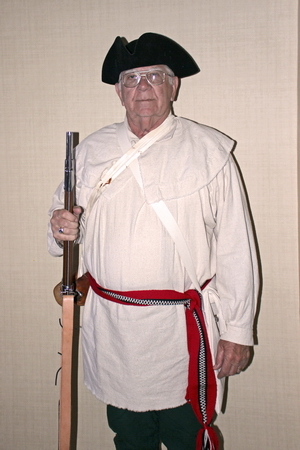 Every effort is made to exactly duplicate the clothing and equipment worn by our patriot ancestors. Click here to learn more. Click here to view a detailed schedule of Color Guard appearances, including mustering times, locations, and other important information. Click here to learn about the Color Guard and the uniforms they wear. Click here to see a detailed history and description of all the flags associated with the MISSAR Color Guard. Patriot Ancestor: Daniel Bartholomew, an Ensign in the Richland Company, Bucks County, Pennsylvania. Ron has been a member of the S.A.R. since April 2016. 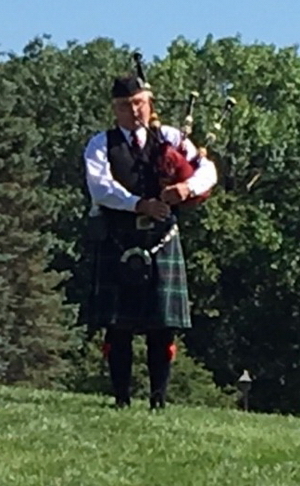 "SAR Commander Gerry Burkland asked me to participate in the Color Guard as a bagpiper." Patriot Ancestor: Gideon Crandall (served 1777-1781) of Rhode Island and Vermont. Paul has been a member of the S.A.R. since 2000, joining the North Carolina Color Guard shortly thereafter. 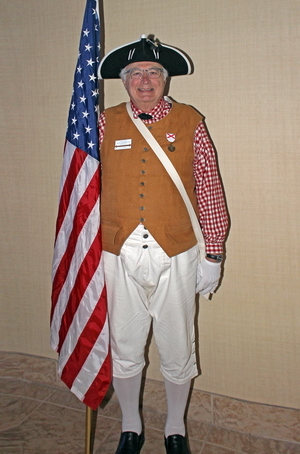 He has been a member of the MISSAR Color Guard since 2014. 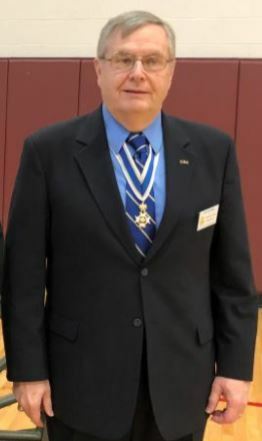 He is also the founder of the NCCSAR Color Guard, and the 2014 recipient of the Von Steuben Medal for Sustained Achievement in the NSSAR Color Guard. "I became a color guardsman to help promote the SAR in the local area of where I lived in NC. The uniform got people to talk about their ancestors. It also allowed me to honor my ancestors who fought for our freedom. I joined also to participate in ceremonies outside of the chapter and to help spread the word about the SAR." Patriot Ancestor: Joseph Conger. Gerald has been a member of the S.A.R. since 2004. 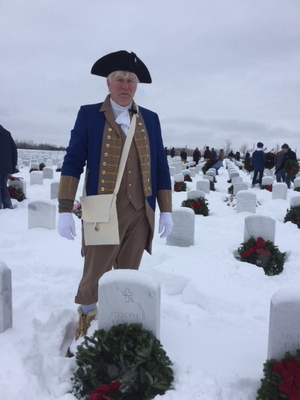 "In addition to the heartfelt patriotism I feel when participating as a Guardsman in Society functions, I especially enjoy participating in Wreaths Across America each year." Patriot Ancestor: Joseph Conger (b. 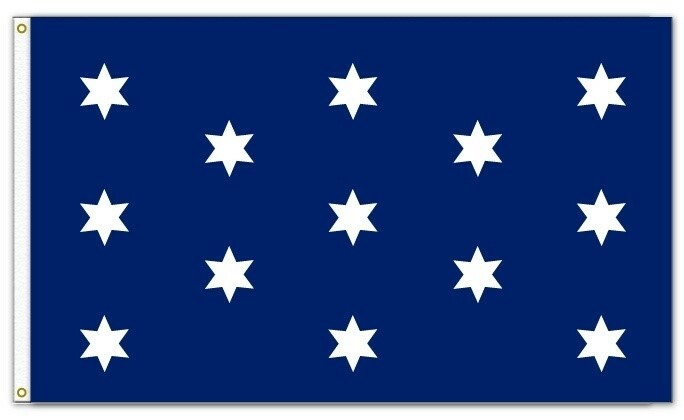 1758), a resident of New Fairfield Connecticut, served as a Private in Captain William Hubbell's Company of Col. David Waterbury's 5th Regiment of Connecticut Volunteers (mid 1775 to 1776), and spent the winter in defense New York. Joseph has been a member of the S.A.R. since June 2002, and the Color Guard since 2011. "I really like the camaraderie. I enjoy learning the history of the Revolution and the sacrifices of our ancestors to secure our liberty, while building a new nation." Patriot Ancestor: Isaac Glynn (b. 1761 Massachusetts, d. 1835 Vermont). Jason has been a member of the S.A.R. since May 2015. "I joined the Color Guard out of reverence and gratitude for my grandfathers' military service and their sacrifices in the name of liberty since King Philip's War. Because of these strong-willed men and their brethren-in-arms, I have drunk deeply of the blessings of freedom." CG Vice Commander Kenneth L. Goodson, Jr.
Patriot Ancestor: Godfrey Shronk (b. 1755 d. 1827 in Philadelphia. 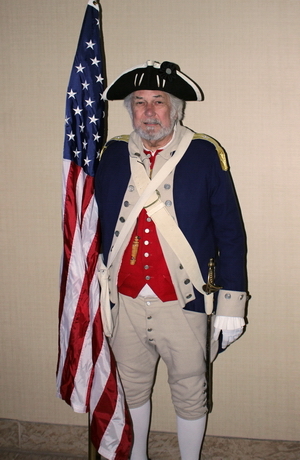 Served as a Private in 1777 in the 5th Battalion, and in 1778, Seventh and Eighth classes Philadelphia Militia. 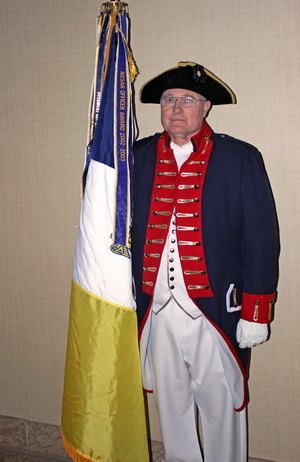 In 1781, Godfrey served in Captain Wagoner’s company of the Second Regiment of Foot City of Philadelphia. Ken has been a member of the SAR since June 2015, and he joined the Color Guard in July 2015. "I joined the Color Guard to participate more in MISSAR activities and to meet MISSAR members outside of my local chapter." Patriot Ancestor: Pvt. 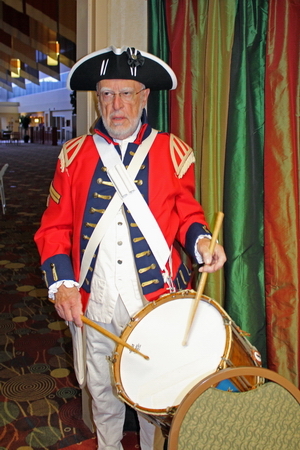 Edward Richards served as Drum Major for Major Jonathan Clark’s 4th Virginia Regiment under the command of Col. James Wood. Having enlisted on 28 February 1778, he carried out his duties with honor to bring the freedom and independence we so proudly hold today. David has been a member of the S.A.R. since 2013. 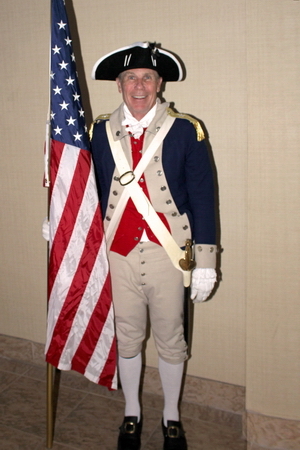 "I joined the Color Guard to continue the legacy set by my Patriot Ancestor. I have been a professional drummer since age 18. I was honored by a personal invitation from Commander Burkland to join the ranks of this prestigious group. I take great pride as part of the community and patriotic service provided by the Color Guard." Patriot Ancestor: Captain Richard Ransom who served under Lt. Colonel Storrs. Capt. 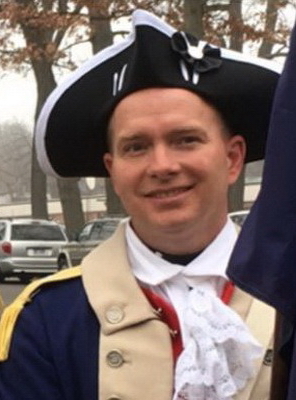 Ransom enlisted into the New York Militia in 1776 and served at the White Plains Battle. Norman has been a member of the S.A.R. since 2012 and he joined the Color Guard in 2017. "(Quote about why joined guard here)"
Patriot Ancestor: Adam Cramer, who was born in 1745 and served in Capt. 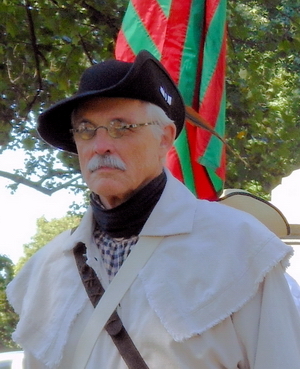 John Wampler’s company in the Pennsylvania militia. Jim has been a member of the S.A.R. since July 22, 2015. Jim has been served in various capacities as a Scout leader for over 25 years. He is semi-retired after working in law enforcement for 46 years and is still working part-time for a local agency. (Quote about why joined guard here)"
Patriot Ancestor: Noah Jenne, a Private in the Vermont Militia who served in the Royalton Raid. Don has been a member of the SAR since July 2005, and he joned the Color Guard in 2010. "I joined the Color Guard because it gave me an opportunity to be more involved in the Society, and it was also a way to honor my ancestor." Patriot Ancestor: William Sharp, who moved from Hanover County to Louisa County, Virginia, in 1763. During the Revolution he had 5 young children so did not serve; however, he sold beef to the Continental Army during the Revolutionary War on a couple of occasions. William has been a member of the S.A.R. since December 2003, joined the Indiana Color Guard in July 2009, and has been serving the MISSAR Color Guard from his home chapter in Indiana since 2016. 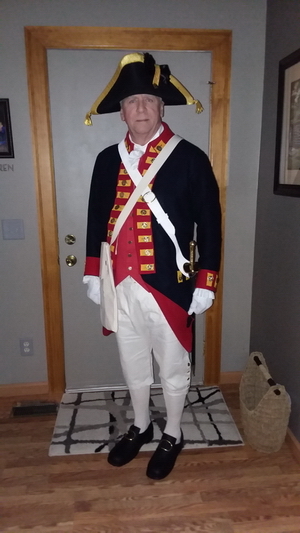 "I wanted to honor my Patriot ancestor and dress as he might have and participate in public events where I would have the opportunity to respond to questions about the late 18th Century period." 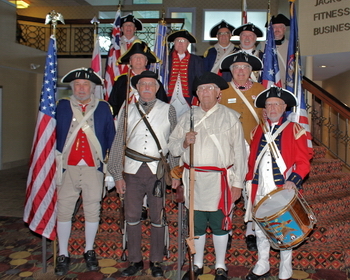 Patriot Ancestors: Jacob Van Wormer, Sr. (2nd Lieutenant, 14th Regiment, Albany County Militia, New York); John Torrey (Private, Connecticut, Battle of Bunker Hill); James Edmands, Sr. (Patriotic Service); Samuel Mosher (Soldier, 6th Regiment, Dutchess County Militia, New York); Daniel Chase (Patriotic Service). Dennis has been a member of the S.A.R. since October 2006, and he joined the Color Guard in January 2016. Patriot Ancestor: John St. John (1750-1819), a Private under Col. Thaddeus Crane of the Westchester Co. militia, 4th Regiment, New York. Aaron has been a member of the S.A.R. since September 2017, and he joined the Color Guard that same month. 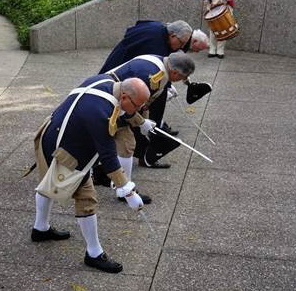 "I had done some re-enacting in the past, so becoming a Color Guard member seemed to be the next logical step. My ancestor was in the militia, and I dress accordingly. 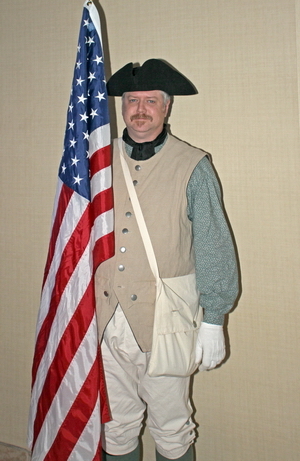 I enjoy showing people the way a person in the militia may have dressed and answer their questions when I can. I am also a member of two local historical societies." Why we ask for your city or town... We would like to have someone contact you who is familiar with your area and can answer your questions.